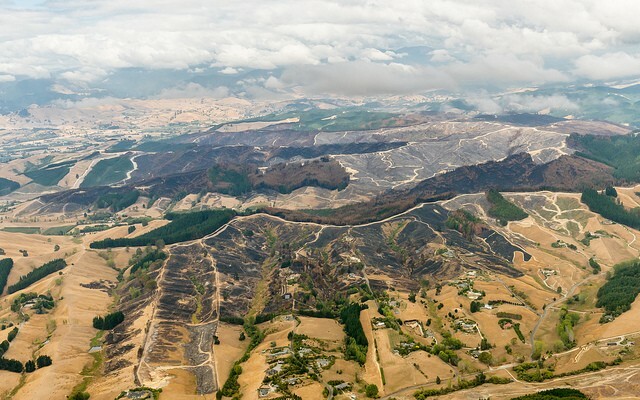 By New Zealand standards, the Pigeon Valley forest fire was a major wildfire. Burning under very dry conditions, it spread rapidly over several days, destroying a house, damaging other buildings and property, and causing the evacuation of more than 3000 residents. It burned 2300ha, which makes it the largest forest fire since the 1955 Balmoral Forest fire in Canterbury, and larger than the 1981 Hira fire which was the most significant fire of recent decades in the Nelson-Tasman region. The majority (~90%) of the area burned was plantation forest, owned by a number of corporate and smaller private forest owners, and including a wide range of different aged forestry plantings from recently cut-over logging slash, newly planted trees with scrub understory, to intermediate and mature forest stands. The drought conditions across the region at the time of the fire had contributed to extremely dry forest and grass fuels. In the case of forest areas, this meant very high fuel loads were available to burn, through the addition of dry soil organic material and larger logs and stumps from the previous forest rotation, on top of existing needle litter, scrub understory, and green canopy fuels. These very dry fuels, together with the hot, dry, and windy conditions at the time and steep slopes in the area where the fire broke out, allowed the fire to spread easily following its ignition and grow rapidly once it entered the forest area. The fire exhibited extreme fire behaviour, burning with high intensity through the first night and second day, with areas of tree torching and crown fire runs producing very large (30m+) flames, and throwing embers 500m or more ahead of the spreading flame front. At these levels of fire intensity (in the tens of thousands of kilowatts of energy for each metre of fire line near the head of the fire), the fire was unstoppable using any of the firefighting methods available, including helicopters and fixed-wing aircraft using suppressants and retardants. Hence the initial firefighting strategy was a defensive one, to evacuate people in front of the fire, protect properties, and to use helicopters and ground resources where possible to attack the fire where it burnt out into more open fuels and to limit the sideways growth of the fire where it was burning less intensely. In subsequent days, once the fire growth had slowed, the focus moved to getting a control line (fire break) around the fire to prevent it spreading further. Then it was a case of hard slog, to dig out, wet down, and extinguish the smouldering hotspots within the fire area; a job made worse by the deep burning resulting from the drought, and hot windy conditions that prevailed over subsequent days and weeks that threatened to flare the fire back up and cause possible fire escapes. 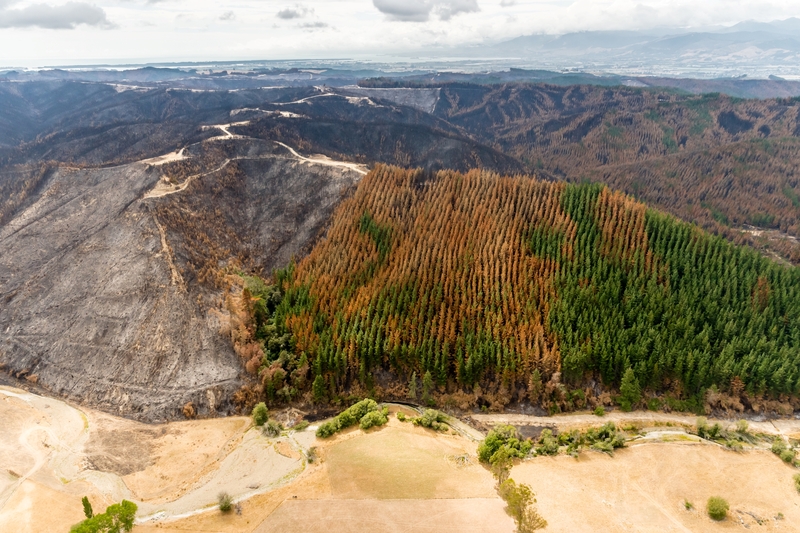 In plantation forests, both in New Zealand and overseas, it is recognised best practice to have identified water sources and fire breaks throughout the forest to assist in the control of fires when they occur. The number or density of these will vary depending on forest size and terrain and, to a degree, the region of the country in which the forests are located which can influence the perceived wildfire risk. Due to its normally higher annual rainfall, the Nelson-Tasman region falls within the mid-range of New Zealand fire climate severity. The region experiences on average around 8-15 days of Very High and Extreme forest fire danger each year, compared with 0-1 day/year for the West Coast, 30-50 days/year for Canterbury, and 20-70 days/year for Marlborough. However, as evidenced by the current fire season, this varies widely from year to year due to changing climatic conditions such as El Nino/La Nina. The recent dry spell has resulted in Nelson experiencing 30 days of Very High and Extreme forest fire danger since January 1st, more than double the average. The area burnt by the Pigeon Valley Fire. The unburnt area around the fire illustrates just how dry the vegetation was across the region. Supplied. The effectiveness of fire breaks is limited by their width, location, maintenance, and the intensity and flame lengths of the approaching fire and presence of trees to provide sources of embers that can be thrown across the fire break. A fire can breach a fire break in one of three ways: through direct flame contact across the break, from radiated heat from flames igniting vegetation on the opposite side of the break, and through burning embers being carried across the break by winds or fire convection currents, including fire whirls. As a rough rule of thumb, in the absence of ember transfer (spotting), a fire break needs to be at least 2-3 times as wide as the height of the vegetation, or 1.5-2 times as wide as the flame lengths produced by the fire, to prevent it being breached through flame contact or radiated heat. So for 20m tall pine trees, which in a crown fire could produce flame lengths of 30-40m or more, the fire break would need to be at least 45-60m wide to stop a fire where there was no ember transfer across the break. However, forest fuels are known for producing embers that can be carried downwind to start new spot fires. Our main forest species in New Zealand, radiata pine, is not as prolific at producing embers as some other species, such as eucalypts, which have been known to produce long-range spot fires as far as 65km away from the main fire! However, they are still prone to short and medium-range spotting, in the order of hundreds of metres to 1-1.5km downwind. Spotting up to 500m or more was observed during the Pigeon Valley fire. As such, no fire break within a forest will be wide enough to stop a fire if ember transfer is occurring. Typically fire breaks within forests are made be widening existing access roads, or by creating fire breaks between adjacent forest stands planted at different times (compartments). As such, these would usually be about 10m wide, maybe up to 20-30m wide around the outside of the forest. A 10m wide break is effective up to an intensity of about 16,000kW/m (6.5m flame length), which would be sufficient for a surface fire in a younger stand with occasional torching of trees; however, at these levels there would very likely also be spotting occurring that would cross a 10m wide break. At 20m wide, a break would technically be effective against a fire intensity up to 70,000kW/m (13m flames), but at this intensity the fire would almost certainly be burning as a crown fire, with medium to longer range spotting easily carrying embers across even a 20m or 30m wide fire break. Internal fire breaks within the forest are more designed to limit fire spread during the early stages of forest growth when fuel loads are generally lower, and also to stop the sideways spread of fires in older stands where flank fires will be of much lower intensity than the faster spreading head fire. This is especially important given that around two-thirds of the total area of an elliptical-shaped fire is burned by the outwardly spreading flank fires, and less than one-third by the head fire. Progressively working along the flanks to “pinch off” the head fire is also the most effective way of slowing and controlling a fast-moving, high-intensity wildfire. A good network of internal fire breaks is also essential to provide access to attack fires in forests, especially while they are still small, burning more slowly, and with lower intensity. Just as importantly, fire breaks and access roads provide escape routes for forestry workers when fires start within the forest, or for firefighters when fire behaviour escalates necessitating fire crew evacuation. External fire breaks are often more about attempting to prevent fires that occur on adjacent land from spreading into the forest than the other way around, due to the fire intensity and spotting limitations in forest fuels highlighted above. However, the effectiveness of external fire breaks can be improved by pruning the outside few rows of trees to decrease the likelihood of the fire burning out of the forest as a crown fire and, by bringing the fire to the surface reducing the fire intensity and decreasing the chance of short-range spotting, thereby increasing the overall chances of the break stopping the fire. Similarly, the use of lower flammability tree or shrub species can also reduce fire intensity, and act as “traps” to catch burning embers as they exit or enter the forest. Where a productive land use is preferred to bare fire breaks, low flammability “fuel breaks” comprising green crops such as lucerne (alfalfa), canola or lupins can be very effective; however, in drought conditions, even these can become water-stressed and burn. To be effective, fire breaks need to be regularly maintained to ensure flammable vegetation, such as grass and scrub, does not regrow in the break making it easier for fires to spread across. The location is also important, and the closer the breaks are together the less time a fire crossing a break has to develop before it hits the next break. In steep terrain, fire breaks are best located in the bottom of gullies or on the tops of ridges, as these are where fires will slow and the break has the best chance of being effective; fire breaks located mid-slope are more likely to be impacted by higher intensity fires resulting from the increased rate of spread on slope. Inappropriately located fire breaks can also exposed the soil to increased risks of erosion. In Nelson-Tasman, the complex terrain on which most of the plantations occur is, therefore, a limiting factor in establishing fire break networks. As such, fire breaks are only one of the many tools used by forest owners to limit the spread and damage caused by wildfires. Availability of firefighting resources, including well-trained and equipped forestry crews, as well as arrangements with fire agencies such as Fire and Emergency New Zealand, neighbouring forest owners, and aircraft and heavy equipment operators, are also essential to effective fire management. In future, with an increasing risk of wildfires like the Pigeon Valley fire due to climate change, consideration of tree species flammability and firefighting water availability will also become more critical to ensure wildfires don’t destroy forests, impact on forestry workers and related industries, or surrounding landowners. Conflict of interest statement: Grant Pearce is a senior fire scientist at the New Zealand Forest Research Institute (Scion), the Crown Research Institute for forestry and wood products. Scion’s Rural Fire Research group receives funding from the NZ Forest Owners Association, Fire and Emergency New Zealand, Department of Conservation and New Zealand Defence Force, in addition to New Zealand science funding through the Ministry for Business, Innovation & Employment (MBIE).